No proof cut needed. I have checked the printable template and double-checked my pickup and control configurations. All custom guards are cut on a non-returnable, special order basis. Available in the classic, Japanese mounting hole pattern. The widest selection of materials and configurations at a fraction of the price of factory guards and MADE IN THE USA!!!! Please allow 5-10 business days to build your custom guard. A business day is Monday-Friday and does not include weekends or holidays. Despite popular belief, unless one is willing to drill new mounting holes/Modify control locations, there is no one-size-fits-all UV style pickguard. Above you will find a thumbnail that will link to a printable template. 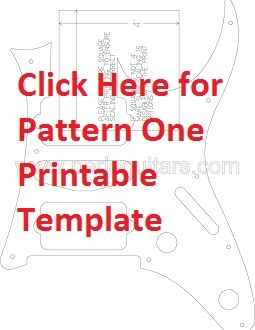 This template has all the critical features on them to verify that the pattern/general control placement will fit your guitar. If you do not mind performing simple modifications (ie- drilling new, non-invasive pickguard mounting holes), it will not be as important to check the template. 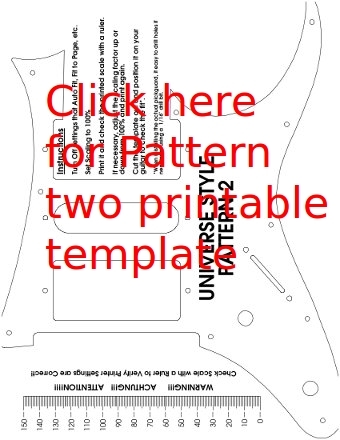 If you do not have the resources available to perform simple modifications or have a collectible guitar that can not be modified it is absolutely critical that you take the time to check this template to your guitar to verify the correct fit. What if you do not have a printer to check the template? Don't have a printer to check the template? For a nominal fee, we can precision cut a cardboard template for you to check the fit before committing to a custom pickguard. Please choose all of your options on the build menu and select "cardboard template" for material type. We will send you a cardboard template of the available pattern/pickup/control configurations that you have chosen from the menu. I ordered pattern 2 in White Pearloid to fit my Ibanez RG752FX, with the Volume/Tone holes left blank as I have a switch instead of a tone pot and the RG752FX has the volume pot in a slightly different position. The pickguard just arrived - I've drilled the volume and switch holes, and it fits perfectly! Really nice looking pickguard, makes the guitar look incredible! Thank you! Perfect fit. Awesome finish. Has two extra screws in case you lose some. Pickguard is vinyl backed so it won't scratch your finish. Click the button below to add the Custom 7 String UV Pickguards to your wish list.